My muse has been all over the place of late. Usually it goes on vacations for extended periods of times without asking. Now, it’s just jumping around—ooh, look at that shiny, sparkly thing…let’s try that!! I really appreciate those of you who stop by and check out my Wednesday Briefs stories. This week I decided I want to focus on flash fiction. I had a lot of fun in Lisa Kessler’s class, and I really want to hone writing a complete story in less than 1000 words. The below story is sort of a sci-fi m-m story. My hope is to keep the same characters and write short pieces about snippets of their lives. I hope you like them or at least keep reading to see how they grow. A bass voice sounded in his ear. “What in the Meridan Galaxy do you expect? You tripped the Clanadies’ security on entry.” The dumbass that belonged at the end of the sentence went unsaid. Gareth sounded really pissed. Well, Sid was just as pissed, and his leg throbbed like the techno beat in Club Paragon. He quickly typed the last of the code into the cantankerous older model Xlite processer, starting the final download to his microdrive. As many of you know, I’m a huge fan of Sherrilyn Kenyon’s The League series. I’ve had Born of Fury and just hadn’t gotten around to reading it. Well, until a couple of days ago. Given the fact I like to read and bed and I now have to wear glasses (grr…), it is difficult to hold a 700 page hardbound novel. Needless to say, I survived! 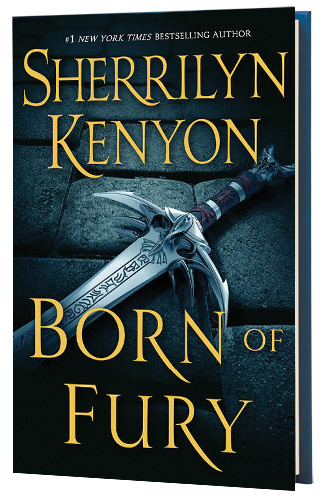 Born of Fury is the 7th book in the series. It’s the story of Dancer Hauk, the massive, lumbering Andarion.